Don’t get me wrong, I am a total makeup fanatic who loves to splurge but let’s keep it real, this girl is definitely on a budget. Launching your own business isn’t cheap and sadly neither is keeping up the high maintenance activities of nail manicures, extensions, and trendy shopping. With my busy schedule, and juggling a handful of wonderful clients, girl, ain’t nobody got time for all that, seriously. Now, I’m not going to say that coppin’makeup from the Dollar Store is at the top of my to do list but, if they do happen to have some of the good stuff, and they often do, I will snag what I can just to keep up stock. On a recent trip to pick up some art supplies I swung by the cosmetics aisle and was enamored with the collection of nail polish and mascara available. L.A. Colors, I must say has some pretty good polish but I had never tried any of their makeup items. 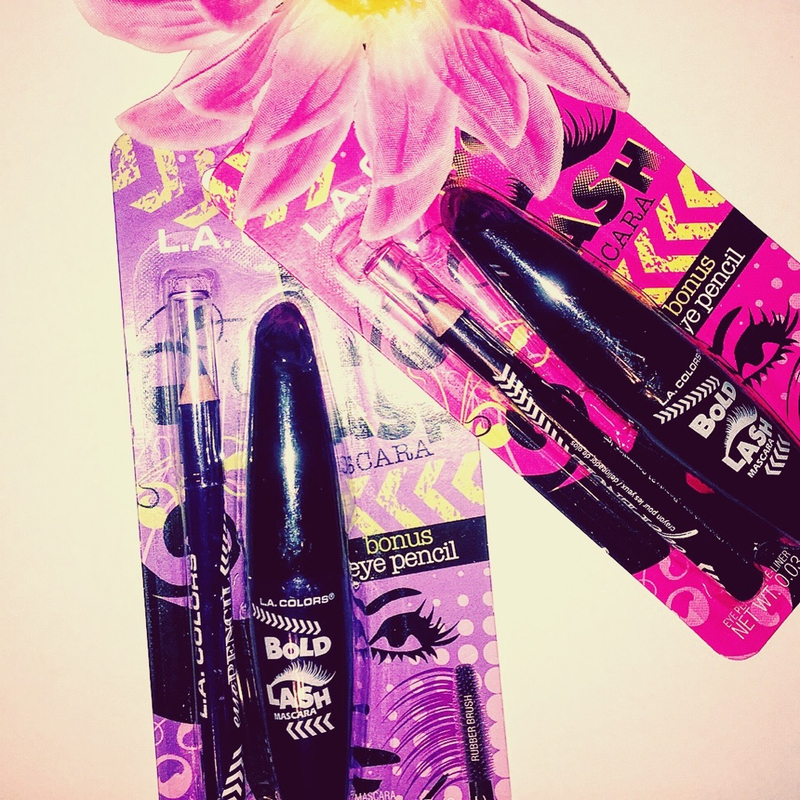 I found a couple double-packs of Bold Lash Mascara and Eyeliner in Jet Black and Ultra Violet that I could not pass up. For about $2 for each pack, the price could not be beat. I figured if the nail polish works decent, the mascara should too. Usually, I do not deviate from my Maybelline XXL but hey, why not live dangerously (hoping I do not get a dreaded pink-eye). In all honesty, these things can happen. So far I have tried both the Jet Black and Ultra Violet Mascara and coordinating eyeliners, and I am pretty happy with the results. The Mascara went on smooth without irritating my eyes. It did not clump and enhanced my lengthy lashes well. I have worn both Mascara products with and without the liner and I must say without the liner is great for a simple daytime look. The eyeliner, gives a nice edge. I also blended the Jet Black Liner and Ultra Violet Liner to create a contrasting cat-eye which looked pretty cool (look for pics on Instagram). The products are relatively small, compact and perfect for tossing in your purse for a quick fix or taking on a weekend trip in which you prefer not to lug your entire kit. The pigment in the Jet Black Liner and Mascara is great as well as the pigment on the Ultra Violet Liner. As far as the Ultra Violet Mascara goes, I would like to have seen a brighter hue to make the lashes really pop with that purplelicious goodness but, otherwise not a bad find for 2 bucks. Check back to find out what makeup products I discover next!